Rent SoMa StrEat Food Park | Corporate Events | Wedding Locations, Event Spaces and Party Venues. 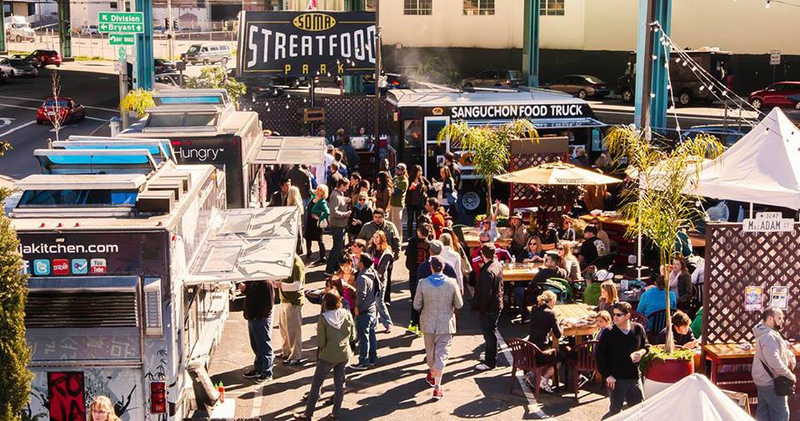 SoMa StrEat Food Park is the Bay Area's first and largest food truck park, beer garden, and event space. We maintain a vibrant community of over 100 of the best mobile food vendors in the Bay, and organize food truck catering off-site and various events at the venue. Enjoy San Francisco's most fun, unique and delicious venue! We work with a revolving list of over 100 of the Bay Area's most delicious food trucks. The Park itself can accommodate up to 13 food trucks at a time and has the capacity to fit over 800+ people. For smaller events of 10-200 people, we have several venues available within the Park for rental, including our School Bus and Deck area, which fits up to 70 and our covered, heated Barn area, which can fit 200 people. We also have a permanent beer and wine bar on the premises and we have the capability to host live music acts and DJs. We can entertain parties of all types and sizes, and are open 7 days a week for both lunch and dinner. *We host a variety of weekly and one-off special events including trivia, comedy, karaoke, craft markets, food festivals, holiday parties, music festivals, and viewing parties for sporting events. Make your stay here extra special and get the VIP treatment by reserving a table for you and your friends inside or outside. We've turned a school bus into a private party space. Our bus features tables, chairs, and TV screens. The Barn is one of the most unique spaces in San Francisco. The Barn's open sides and picnic tables give you all the joys of an outdoor space but also features, TV screens, sound systems and heat lamps. You can now book the entire park for special occasions. Have full use of all our facilities including the Barn, the School Bus and Carnival games. You can also choose your favorite trucks to create your own blend of culinary curiosities.